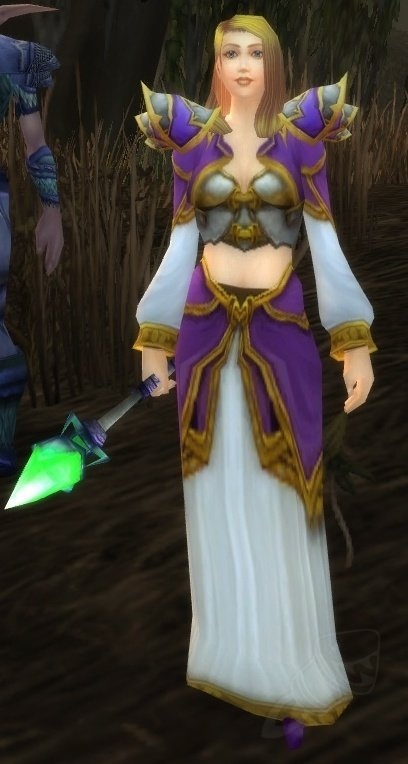 Event NPC you need to speak to in order to procede with the Escape from Old Hillsbrad quest. Once spoken to, the epoch hunter will appear and mobs will spawn in waves. Taretha Foxton, childfriend of Thrall. Thrall's first action as Warchief was to attack Durnholde in an effort to dismantle the entire internment camp system. He secretly met with Taretha, asking her to leave Durnholde with her family, but she refused, hoping that it would never come to battle and fearful of the consequences if Blackmoore noticed her missing (Blackmoore had taken her as his mistress, an arrangement she had never been happy with). When Thrall arrived at Durnholde with the Horde at his back, he confronted a drunken Blackmoore, and asked for a peaceful parlay in order to prevent useless bloodshed. Blackmoore went through a plethora of emotions - from amusement at Thrall's rise to power, anger at what the Warchief was demanding, and grief at how Thrall had supposedly betrayed him. Once again demanding that Blackmoore surrender or be killed, the master of Durnholde gave his response...by tossing the severed head of Taretha Foxton into the courtyard, screaming that this was what he would do with traitors. Thrall screamed in rage and grief, the elements themselves echoing his fury, and he gave the command to attack. During the siege, Thrall cornered Blackmoore in his hidden tunnel, and tossed a sword at the traitorous man's feet. Blackmoore had sobered enough to hold his own against the Warchief - who had been holding back to allow Blackmoore a fighting chance - but when he tried to explain, and asked for Thrall's aid to help him subjugate the Alliance, the Warchief's rage at Taretha's fate broke all barriers, and he struck the mortal blow. As he lay dying, the master of Durnholde expressed pride in what Thrall had become - what Blackmoore had made him...or so he thought. Thrall emerged shaken from the castle to find his orcs victorious. Thrall gave a message to Blackmoore's second-in-command, Lord Karramyn Langston, to take to his superiors: to free the remaining orcs, and to cede land for their use. If the Alliance would let them be, they would not trouble the Alliance and would be willing to engage in cooperation and trade. If the Alliance chose to fight them, they would have made an enemy the likes of which had never been seen before - making the old warlock-controlled Horde shrink to insignificance. He then left Durnholde after allowing Sergeant and the surviving humans to walk away unharmed. When they were gone he called upon the Spirit of the Earth to destroy the keep, before leading his people to freedom. In a quest chain you learn that she and Elysa are one in the same-so she can also be found in alterac. He makes a comment about her in the completion text in Warchiefs Blessing (the Quest that horde DK's get at the end), he says that there have only been two nice humans those being Tirion Fordring and Taretha. Hers is the saddest story I've yet read in Warcraft. I actually cried when I read it. Not surprisingly, Taretha has the same face/hair combination as (the pre-patch 3.3) Jaina Proudmoore. Kind of a subtle reinforcement of Thrall's feeling that Jaina reminds him of Taretha. Indeed, this story is very sad. I feel sorry for Taretha's end. I'm sure Arthas would have killed Blackmoore. In the book: Arthas, Rise of the Lich King, he feels sorry for Taretha. He had a snack with her and they talked. And both Arthas and his father didn't approve of Blackmoore for he wasn't sober most of the time. Long story short, Taretha is the one that actually helped free Thrall, she was the one who set fires to the encampments and snuck Thrall out of the Keep. The reason you are here in Old Hillsbrad, is because the Black Dragonflight is stopping this from happening. Of interesting note: the screenshot shows her with blond hair, as she appears ingame. But when i click on View in 3-D, it changes her haircolor to black. "What is happening to your eyes?" asked Thrall. "These are called tears. They come when we are so sad, so soul sick, it's as if our hearts are so full of pain there's no place else for it to go." Taretha explained. "You are so innocent, Thrall. So pure. But someday you will understand." That day would be the only day that Thrall let tears. For the same person who taught him what they meant. Think he cried when Grom died? In the Caverns of Time you can do the Durnholde instance. When you enter the instance, talk to the humanoid Erozion, he will give you these Incendiary Bombs. If for any reason you lose them, go back to him and get more. Taretha sagt: Ich bin frei! Ich danke Euch allen! Taretha sagt: Sie schimpfen dich ein Monster. Aber in Wahrheit sind sie die Monster, nicht du. Lebe wohl, Thrall. Taretha sagt: Thrall, du bist entkommen! Taretha sagt: Thrall, ich habe diese Leute noch nie zuvor gesehen.